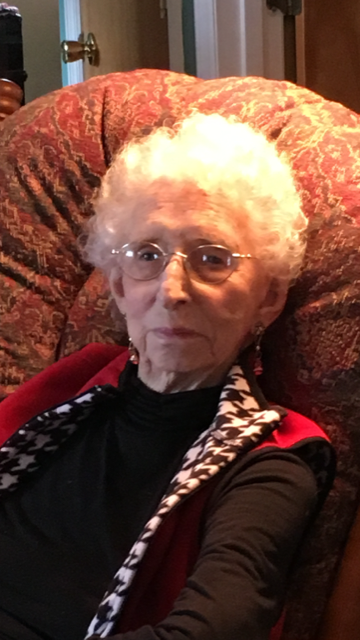 Lois Parnell Gibson died peacefully and in the care of loved ones at Morrison Manor in Laurinburg, NC on November 8, 2018. She had recently celebrated her 95th birthday. Lois was born in the Centerville community near Fairmont, NC on August 20, 1923 to Edward and Mollie Potter Parnell. She is preceded in death by her parents and four sisters, Louise Britt, Queen Britt, Joyce Gibson and Sally Shaw and one brother, Wallace Parnell. She is survived by one sister, Isabell Woodell of Wesley Pines in Lumberton and one brother, Charles Edward Parnell of Lady Lakes, Florida. Lois graduated from Lumberton High School and began work at Southern Bell as a telephone operator. In 1948, she married E. Harold Gibson from Gibson, NC, who also preceded her in death. They lived and farmed in the St. John community where she has enjoyed a full life until her death. After her marriage and move to Gibson, Lois completed a bookkeeping course and began her career working first at the Laurinburg Airbase, then McCarter Electric, Southern National Bank, and McNair Seed Company. She retired from Scottish Foods. During each of these job tenures, she made lifelong friends who have remained close to her. Lois loved her family, her friends, and especially her church, St. John United Methodist. She was active in the United Methodist Women, the church administrative council, the annual Harvest Day, and all other church events. She loved the Lord and lived her life dedicated to His work. Lois is survived by her two daughters, Rhonda Gibson Hester, of Gibson and Nan Gibson Robinson of Columbia, SC. Her grandchildren and great grandchildren and the light of her life are: Wade Gibson Logan (Emmy) and Otto and Ollie of Indian Land, SC, Carrie and Anya Robinson and Brittney Cassar of Columbia, SC, David Hester (Wanda) and D.J. and Teddy of Lumberton, and Scott Hester (Kristie) and Olivia and Erin of Cary, NC. Special sons-in-law, Wilbur Hester and Jim Robinson, preceded her in death. She is also survived by a sister-in-law, Harriet Smith, of Asheboro and many special nieces and nephews. “Doe Doe” was the affectionate name given to Lois by her first grandchild, Wade. She was lovingly called “Doe Doe” thereafter by his friends, her future grandchildren and all of their families, and many others. “Doe” Doe” loved playing Bridge, cooking and baking her delicious caramel cakes and other family favorites, sewing, dressing in bright colors, canning and freezing vegetables, vacationing at Scarborough Landing at Lake Marion, family reunions and Thanksgiving dinners. Services will be at the St. John United Methodist Church on Sunday, November 11, 2018. Visitation will be in the fellowship hall beginning at 2:00 p.m. and the funeral service will be at 3:00 p.m. in the church sanctuary. Burial will follow at Pinecrest Cemetery in Gibson. The family requests memorials to St. John United Methodist Church, P.O. Box 181, Gibson, NC 28343 or Scotland Regional Hospice, P.O. Box 1033, Laurinburg, NC 28353.